Nice Package: Oak Cliff Coffee..
Can you compost your coffee bag? Could I really compost this bag? What would happen if I put it in the garbage instead? I soon found myself navigating a topic that is not always as simple as it may seem. There are a variety of options for compostable bags. Some of you may have already seen Omnidegradable packaging from TekPak Solutions (used by companies like Wrecking Ball Coffee) and Biotrē from Pacific Bag, Inc. 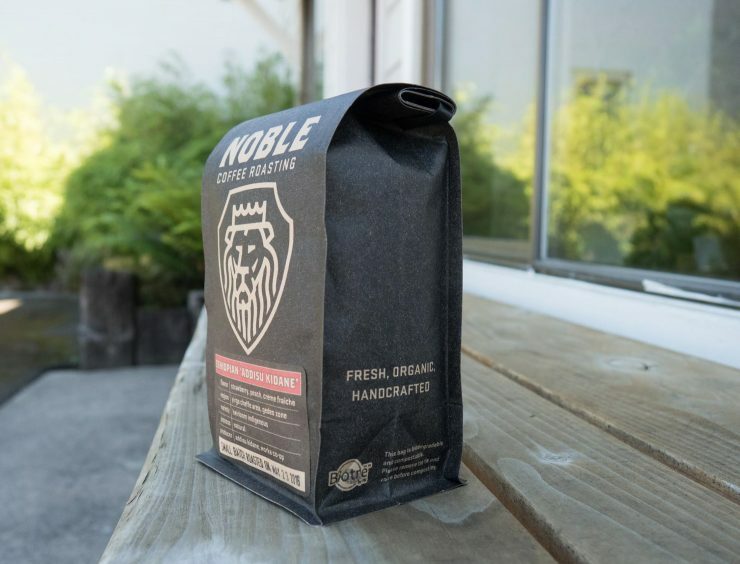 The latter is the bag I first came across from Noble Coffee Roasting, and it’s used by many other notable roasters like Counter Culture, Spyhouse Coffee, Water Avenue Coffee, and Huckleberry. What sets these two particular bags apart from other compostable and biodegradable options (like a pure paper bag, for example) is that they come with the barrier needed to protect the coffee. The outer part of this bag is paper-based and the inner liner is a plastic with an additive which allows it to break down over time. Counter Culture bags, made by Biotrē. But does that make a 100-percent compostable bag? Not really. First, the tin tie and valve need to be removed, destined for the trash. Second, it’s important to note that “biodegradable” and “compostable” should not be used interchangeably. “Biodegradable” refers to any material that breaks down (or has an additive that will help it break down) and decomposes in the environment; “compostable” means that the material is organic matter that will break down and produce soil. The Biotrē bag in particular is 60 percent (by weight) biodegradable, made from wood pulp. This part is compostable. The remaining 40 percent of the bag is a polyethylene liner with an additive allowing the liner to break down over five to 10 years—much faster than a conventional fossil-fuel-based liner but still hanging around in your compost or garbage pile for quite some time. A Biotrē bag’s inner lining after 101 days in compost. “If a product is certified as compostable, the whole thing is compostable,” says Brenda Platt, co-director of the Institute for Local Self-Reliance. “There’s no such thing as 80-percent compostable and 20-percent not. Either you’re compostable or not.” Platt recommends that people refer to products certified by the Biodegradable Products Institute, a third-party organization that certifies entire products that meet the US Standard ASTM D6400 or D6868, sets of guidelines that lay out the requirements for products to be able to be composted in municipal and industrial facilities. A dis-tied and de-valved bag from Sightglass Coffee. The paper part of the Biotrē bag has been tested against these standards and will break down into compost in around 84 days. But the other 40 percent still needs to be disposed of, as detailed in this video. If you compost the bag at home, “as you are raking, you take it out and dispose of it separately,” says Bill Walters, Vice-President of Technical at Pacific Bag. If you are not composting at home and the bag heads to a landfill instead, “you will get the same breakdown as a newspaper,” says Walters. Just a bowl of scraps, waiting to be composted. What happens after we are finished with a coffee bag is not the only important part. “We know that most of the environmental impact for packaging occurs in the production part of the lifecycle. This is where material types, whether the source materials are recycled or virgin, and how much and what type of energy is used to produce the packaging can make bigger environmental differences,” says Bruce Walker of the City of Portland’s Bureau of Planning & Sustainability. Pacific Bag’s Walters understands this importance. “Ideally you want 100-percent renewable materials and 100-percent compostable,” says Walters. With that in mind, the company is currently working on a new version of the Biotrē bag, made with 100-percent renewable materials, including the valve. Anna Brones (@annabrones) is a Sprudge.com staff writer based in the American Pacific Northwest. Read more Anna Brones on Sprudge.